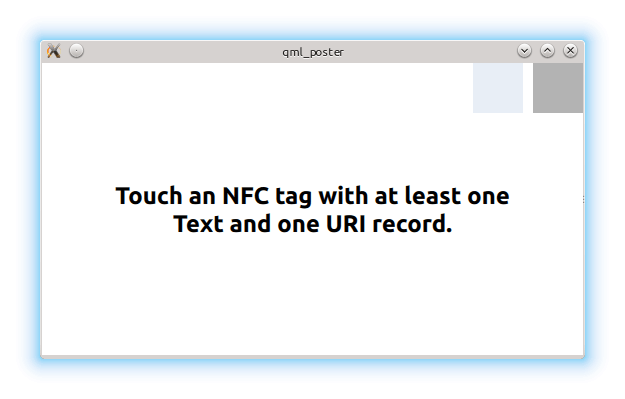 The QML Poster example displays the contents of specifically formatted NFC Data Exchange Format (NDEF) messages read from an NFC Tag. The NDEF message must contain a URI record, an optional image/* MIME record, and one or more localized Text records. The example is designed to display the content of a very specific type of NFC tag. The tag must contain at least one URI record and one text record. If those two record types do not exist, nothing will happen. Such filtering is applied via the NearField type's filter property. The property accepts a list of NdefFilter objects.